This Is Our Bolt-in/Drop-in/Resembles Original Style Extreme Heavy Duty Aluminum Radiator Assembly for B/RB Engines. It comes complete with Shroud Brackets to accept Original Four Screw Mounting Shroud (2998326). Radiator Core support Opening is 26". Comes with our "State of the Art" 2 Row X 1 1/4" Core for Excellent Cooling Ability. The Top Tank Resembles the Old Style Blackstone Tank found on most Older Muscle Cars. 5-For Maximum Cooling we use the 2998326 Shroud, 215049 Thermal Fan Clutch, & 220618 6 Blade Fan.For RPM sensitive we use our 4120758 Viscous Fan Package . 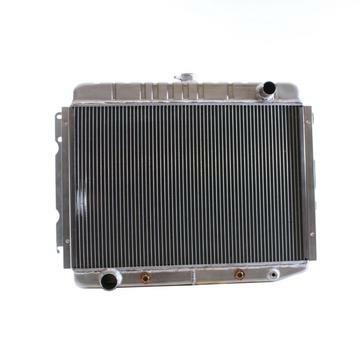 6-This Radiator is generally used on Automatic Transmission Vehicles, since there is a Transmission Cooler Built In. But can be used in an Manual Transmission application also.